Tetra Tech Scandal: Was Radioactive Material Shipped to Pittsburg Landfill? A Contra Costa County supervisor is asking for an investigation into allegations that radioactive material was possibly sent to the Keller Canyon Landfill in Pittsburg, California. "We need to understand what is in the landfill as well as what the risks are. It's important that we find out for the safety of our communities," Supervisor Federal Glover told KQED. He has requested Contra Costa County staff prepare a report in time for the next Board of Supervisors meeting on May 1. 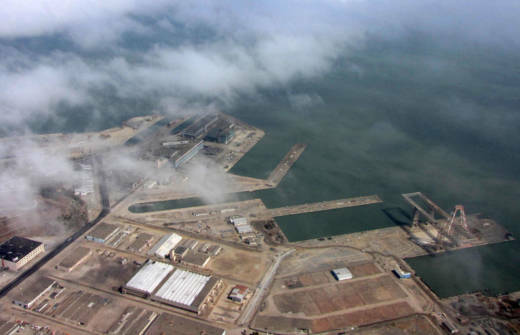 This is the latest development in a months-long scandal that began with reports that Tetra Tech, a contractor hired by the U.S. Navy to clean up the San Francisco Naval Shipyard at Hunters Point, may have botched the job so that the area may still be polluted. The shipyard was formerly home to a Cold War-era nuclear warfare testing laboratory. Both the Navy and the Environmental Protection Agency have reported soil sample data collected by the company was flawed. This week, for the first time, Tetra Tech defended itself, saying it stands by its work and is willing to pay for an independent contractor chosen by the Navy to independently test the site to prove it met Navy standards. "What we did was proper and followed all Navy and regulatory guidelines," said William Brownlie, the company's chief engineer, at a brief press conference. "We believe that any concerns created by false claims can be addressed by resampling." Brownlie said accusations of fraud are false; he said whistleblowers claiming the company mishandled the cleanup may be financially motivated. Until now, Tetra Tech and its subsidiary Tetra Tech EC have respected the Navy's protocol and have not commented on media or public inquiries but instead have referred them to the Navy for response. However, in light of the barrage of recent negative and misleading media reports, Tetra Tech is compelled to defend itself and it's work at Hunters Point. At the press conference, Bradley Angel, executive director of the San Francisco environmental justice group Greenaction, agreed the site should be retested but questioned whether it could ever be cleaned up enough for people to live there.